Following February’s gargantuan supply, the number of bottles sold on the open market in March cooled to a slightly less heady 4,798. While volumes dipped, values did the opposite. March saw frankly incredible increases in some of the Rare Whisky indices. 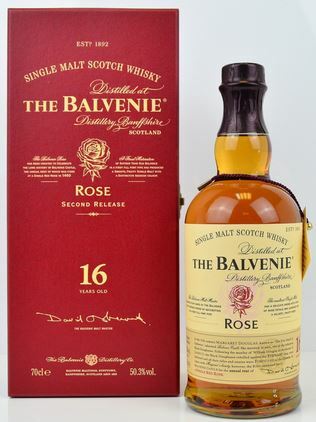 Increases which cannot be sustained in the medium to long term; none the less, if you’re a whisky collector with an eye on the value of your collection then this is one of the rosiest months/quarters on record. March’s big bottle of Scotch was brought to market by Blackpool based auctioneer, Whisky-Online Auctions. Their record setting Port Ellen Queens Visit 12 year old set a new record for the most expensive bottle from the deceased Islay distillery when it fetched £12,100. £12,100 is no drop in the ocean for one single solitary bottle of Scotch, however, it was a bottle of Japanese whisky which made the months most expensive bottle. Dunfermline based auction house Just-Whisky managed to bring one of only 24 bottles of the Karuizawa 5th Ghost to auction which made an exceptional £15,025. The 1964 Wealth Solutions bottle came a close second place at £14,000, albeit significantly down from its £19,000 high in September last year. Following the arrival of spring (someone please tell that to whoever’s in charge of the weather in Scotland), the closing out of March also signalled the end of quarter one. A quarter which has seen the continuation of recent increases in value for old/rare/collectable bottles of Scotch. 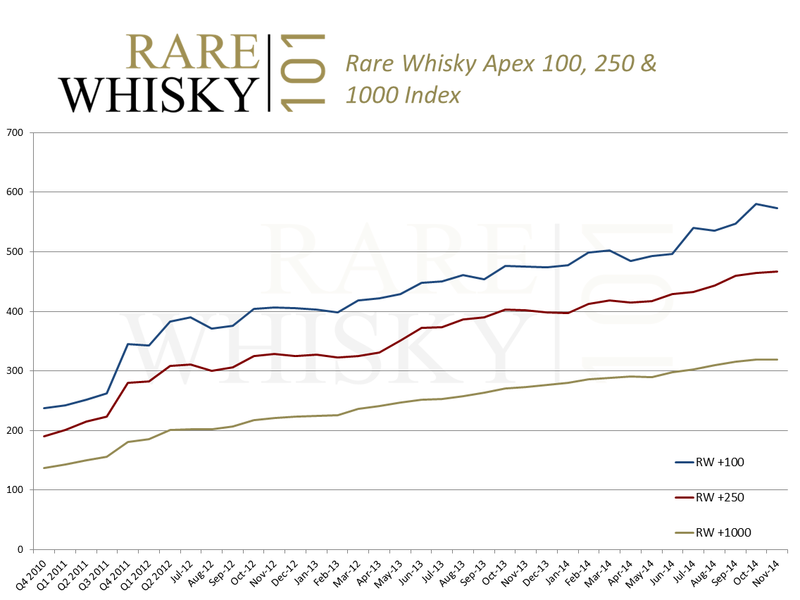 The two benchmark indices, the Apex1000 (tracks the best performing 1000 bottles of Scotch) and the Icon100 (tracks a fixed basket of regularly traded collectables) have made good progress. Both indices are ahead of 2015’s performance over the same period. Macallan and Karuizawa almost completely traded places with the immensely collectable vintage Macallan 18 and 25 year olds almost neck and neck leading the performance tables. Karuizawa has further stabilised as would be expected following recent meteoric rises. Amid continued descent, the Port Ellen index remains the sick parrot in intensive care. Bottles of 1st release were, at one time, regularly managing £1,800 – £1,900, a figure which is now more like £1,500 – £1,600. Have the official releases become an icon for overly rapid retail price hikes resulting in brand aversion? We will inevitably see a bottom for what was 2015’s key performer, that’s a certainty. But when it hits, the question becomes will it recover or will it see the ‘flat-line of Karuizawa’? There will always be value in Port Ellen and we’ve seen many Rapid recoveries over the years but the fact remains, Islay’s best loved pile of rubble wants to stay in the red. As to Macallans recent surge for older, rarer collectable bottles; to some degree increasing scarcity of supply is at work. Throughout quarter one 2015, there were a total of 9,378 bottles of Scotch sold on the open market. In 2016 that figure has soared to 14,033, an increase of 49.64% year on year. Over the same time-frame, there were 47 bottles of 1960’s and 1970’s vintage Macallan 18 year olds sold in 2015. In 2016, that’s reduced to 41, a 12.77% decline. In common with a whole host of bottles showing the most significant increases, general supply’s up but rarities and ultra-desirables are disappearing. A trend we expect to continue. 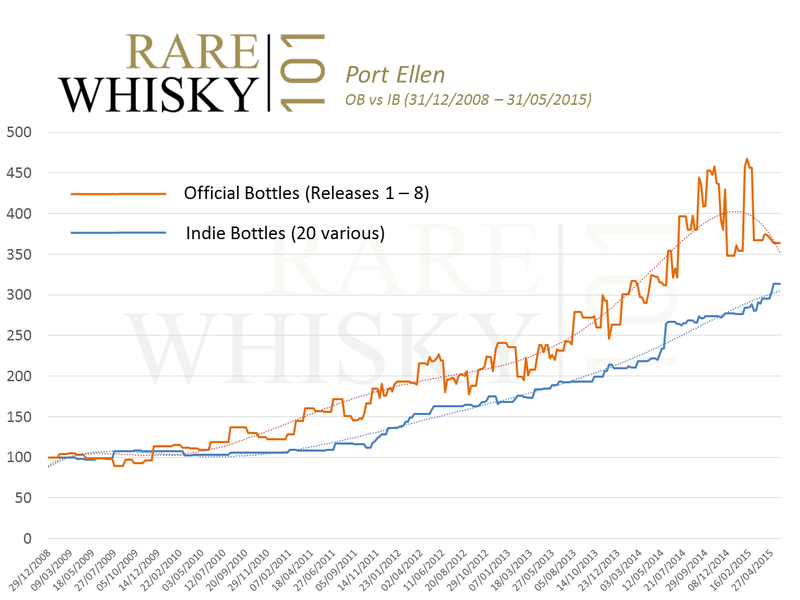 Growing Volatility for Officially Bottled Port Ellen. Following April’s record month for the highest number of bottles sold on the open market (4,309), May cooled significantly at 3,304. That’s still a 6.37% year-on-year increase but 27.92% less than last months performance. Strong demand and further hardening of values in certain areas of the market was ever more apparent throughout May. Conversely, ever increasing polarisation forced other brands/bottles deeper into negative territory. Particularly striking was the extreme volatility currently being experienced in the Port Ellen Index. 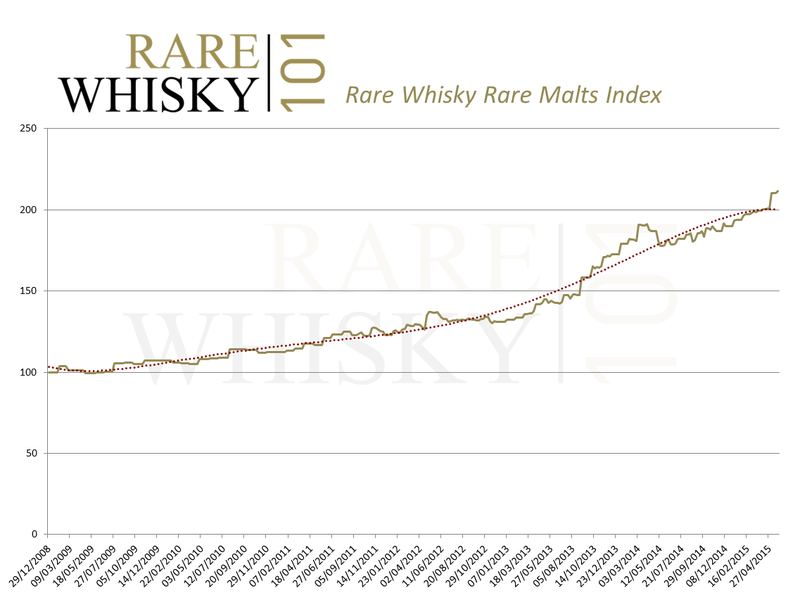 The Rare Whisky Port Ellen Index (RWPEI – covering releases 1 to 8 inclusive) re-traced by -0.94% during May. Not in itself a disaster; however, three month yields for this index currently stand at -20.33%. Does this signify a marked change in the market for Port Ellen? Increasing volatility and a three month loss of 20%+ warranted further research. The chart below shows the (OB) Port Ellen Index alongside a selection of independent bottles (20 bottles were randomly selected which have regular sales on the open market). Smooth growth for IB Port Ellen. OB’s are now experiencing significant volatility. Taken over three months, the official bottles have moved from an index score of 456.77 to 363.90. The independent bottles have moved from 288.71 to 313.59. There are a number of reasons for this stark contrast. As we’ve highlighted in previous updates, the most prominent reason is the erosion of perceived primary market value for the official releases. Secondary market buyers are turning away from the OB’s to pursue better value among the IB’s. The average price of the OB’s remains significantly higher at £809.70 versus £302.50 for the IB’s. To a lesser degree, Brora mirrors this trend. 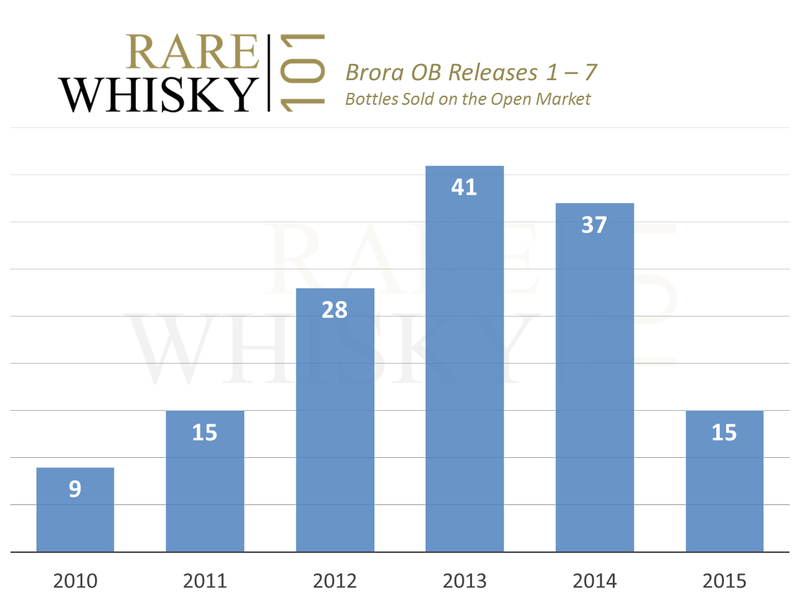 The Brora OB Index was the worst performing Rare Whisky index throughout May losing 2.89% (three month numbers see an increase of 2.15%). Japan remains an almost permanent fixture at number one. Following April’s 26% increase for the Karuizawa Index, a rather more sedate but still impressive 11% uplift was observed in May. We sit on the fence in terms of future gains for Karuizawa. Such rapid increases generally suggest there will be an equally rapid re-trace (or at best a period of stability); however, the lack of available product and ever increasing demand could equally mean continued upside. The benchmark Icon100 index showed a small loss for the month, closing down 0.49%. A decline in through-the-month sales for many of the bottles resulted in this relative stagnation. 14/100 bottles increased in value, 74/100 bottles remained static and 12/100 bottles decreased. The Rare Malts Selection Index took a marked 5.53% uplift. Very positive in isolation, this should be viewed as something of a spike driven by a small number of rarities which sold for huge record amounts. That said ‘a rising tide floats all boats’ and we’re starting to see some of the less desirable bottles in the series move up alongside the ‘big’ bottles. The average per-bottle price of a full-house of the RMS series at the end of 2014 was £375.80; that now stands at £417.10. 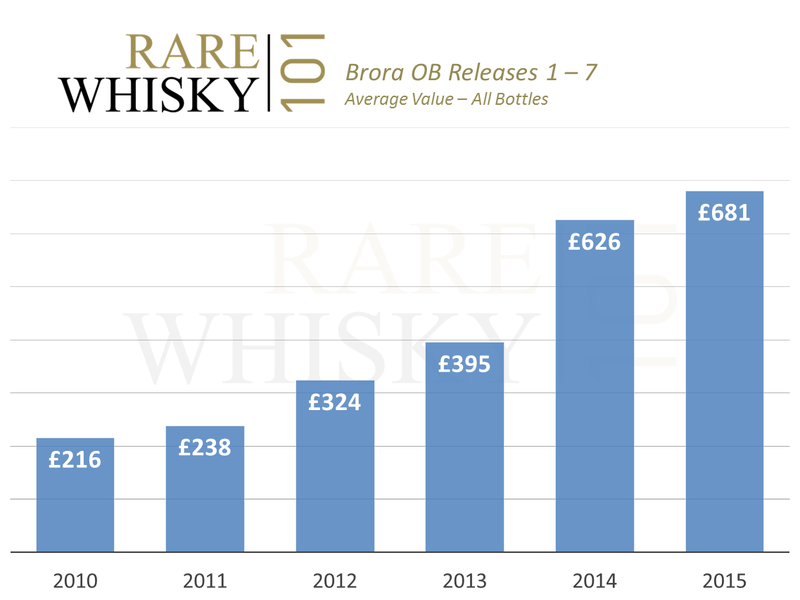 Solid growth for the Rare Malts Selection bottles. Are May’s increases a spike? In common with previous months, Macallan 18 and 25 year olds saw values harden. In contrast to this performance, we’re seeing increasing stress for recent releases. The separation in performance for older discontinued Macallan bottles bearing an age statement/vintage, (hypothetically) appears to be a driving force in the ever widening divide with the poor performing non-aged contemporary releases. Further detailed analysis is required to prove/disprove the collectability of aged/vintaged Macallan vs non-aged. Perception as to the quality of the liquid, however personal and ambiguous, also has to be a factor. We plan to fully review this later in the year. 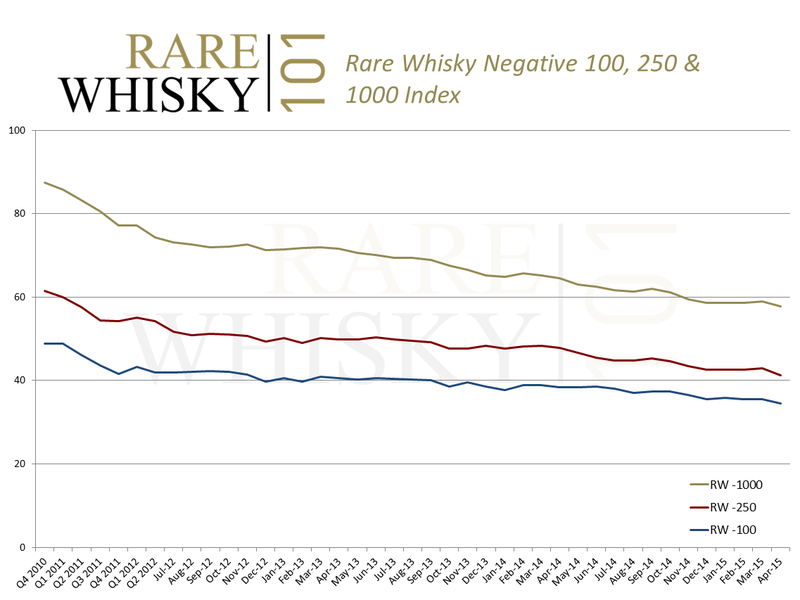 Aside from the composite indices above, the rare whisky market in general appeared positive. The Apex1000, Apex250 and Apex100 indices were up 1.50%, 2.40% and 0.86% respectively. The negative indices continued to remain at all-time lows. Negative Indices continue to be governed by bears. 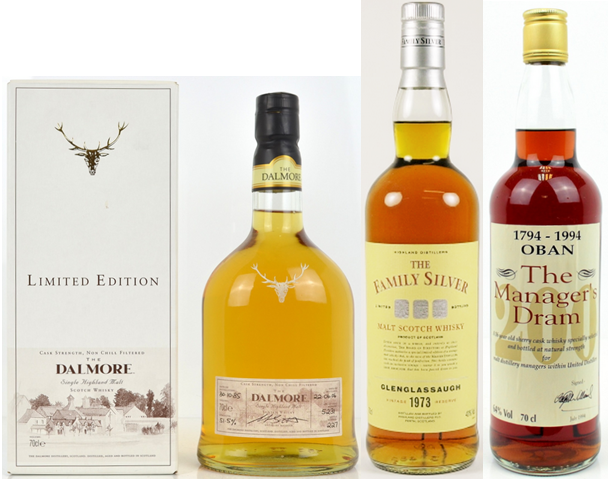 As we move to the half year review stage at the end of June, the sheer number of auctions selling rare whisky throughout the month is vast; we’re expecting record/near-record volumes to be seen. These volumes could have a marked effect on the perceived value (or lack of it) for certain brands and certain bottles. We look forward to sharing the results in due course. Values Harden amid Shortening Supply. Following a plateau/slight re-trace in whisky values at the end of 2014, vast open market supply looks to have calmed to more manageable levels. 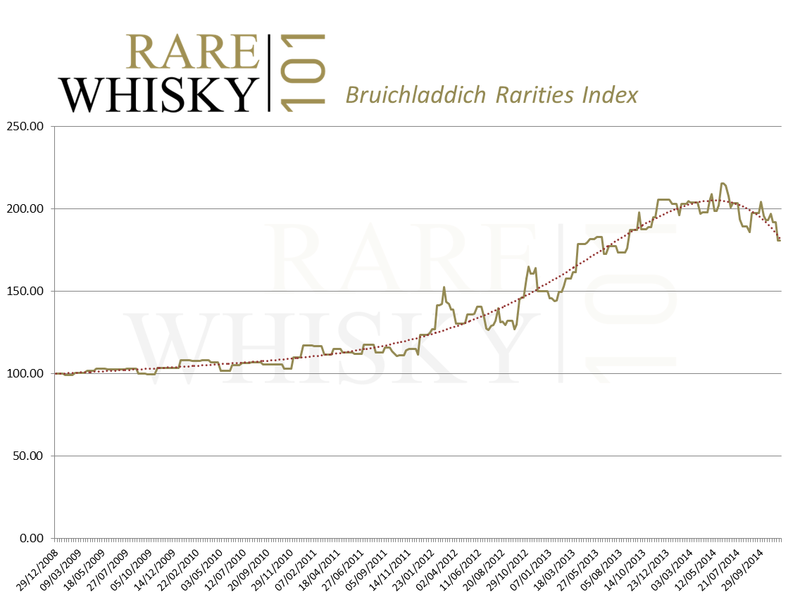 That relative back-step in supply enabled rare whisky values to progress, in some cases significantly. The total number of bottles seen on the open market in February amounted to 2,690, still some 28.8% ahead of the 2,089 seen in February 2014. When 2014’s total growth of 68% is taken into account, 28.8% feels more ‘relaxed’. Throughout the first two months of 2015 we’ve seen 6,029 bottles hit the open market, up 45.7% on the same time period in 2014. When February volumes are directly compared to Decembers record 4,153, (a 35.23% drop) volumes look to be cooling a little which should be positive for overall values. The significant jump in the Port Ellen Index was primarily due to the 4th release doubling in price, increasing a staggering 106.25% (£800 to £1,650). This coupled with a 23.34% gain for the 3rd release reversed the steep drop we saw at the end of 2014. The benchmark RWIcon100 Index outperformed the general market, increasing by 5.89%. Yet again, bottles with older age statements and older vintages led the way. Good growth was seen for Dalmore’s 1973 30 year old (up 46.67% on Jan), Laphroaig’s 40 year old (up 26.53% on Jan) and Macallan’s 30 year old blue wood box variant (up 26.43% on Jan). The Glenlivet 1972 Cellar Collection was also up an impressive 25% on January. 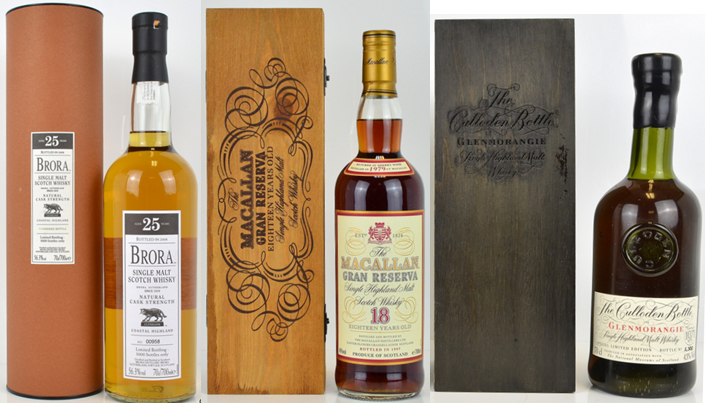 Among the worst performers were Springbank’s 25 year old Frank McHardy bottle which lost 30.43% and Macallan’s 1971 25 year old Anniversary Malt which fell by 19.05% (in part resulting in the Macallan 25 year old Index staying in the red). 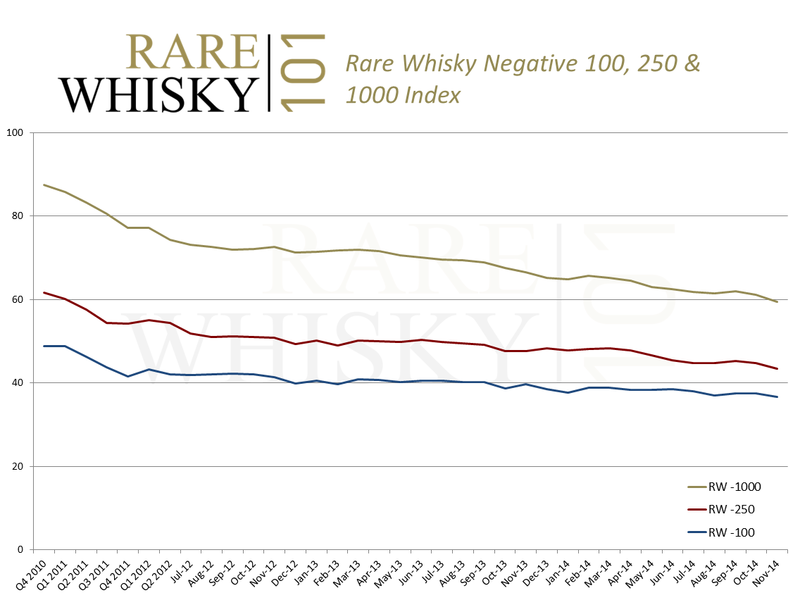 Glenmorangie’s 1971 vintage Culloden bottle also moved down by 20%. 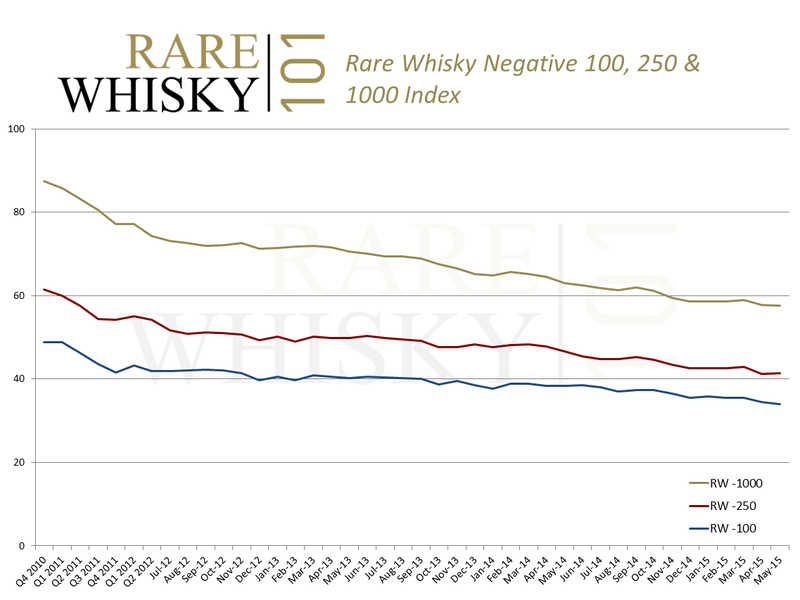 Over the past three months Karuizawa values have remained static, albeit static at all-time highs for the brand. February saw further increases in demand pushing prices to new records. The ever expanding desire for bottles of rare Karuizawa shows no immediate sign of calming amid relatively scant supply. Scant supply and the knowledge that any remaining casks will, at some point run out, should see values advance. 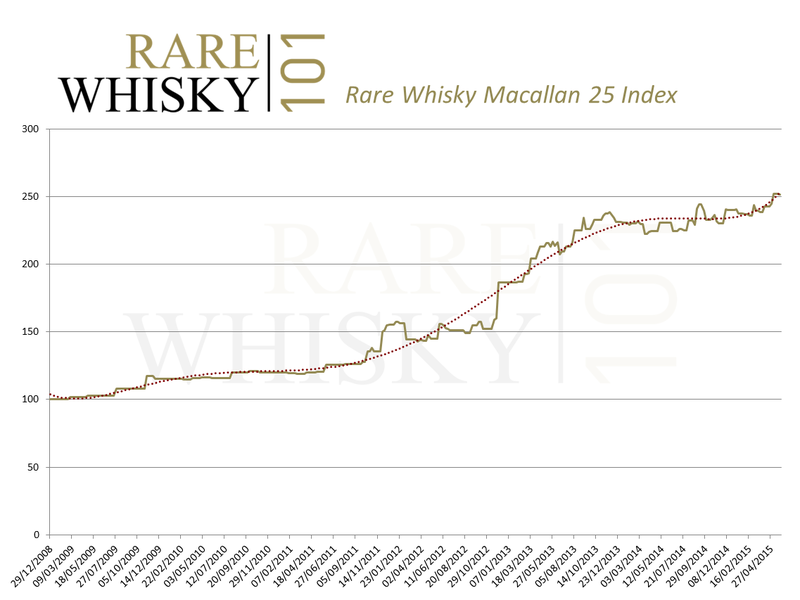 The Macallan 18 year old index bucked its 2014 trend and performed admirably, crystallising a 3.33% gain on January. Putting that into context, the Macallan 18 year old index increased by 3.57% over the whole of 2014. Are the 18’s due a more sustained increase? The Apex Indices (the best performing 1,000, 250 and 100 bottles) also reversed their recent, but marginal, down-trend. All indices made good progress with the best performance seen at the top end of the market where the RWApex100 index moved up 6.79%. The RWApex250 increased by 3.50% and the RWApex1000 increased by 1.53%. In stark contrast to the positivity of the main key performance indicators, the negative indices continued to fall (albeit slightly). The RWNeg100 fell 1.22%, the RWNeg250 fell 0.22% and the RWNeg1000 fell by just 0.02%. As the oversupply of winter passes, the approaching onset of spring looks to be bringing more than just green shoots to the right bottles.